I'm sitting enjoying a cappuccino in the warm Adelaide sunshine, while some of the best cyclists in the world walk past my table. In swift succession I eyeball world champion Peter Sagan, German sprinter Andre Greipel, and Australians Mark Renshaw and Richie Porte, dressed in their race kit and running shoes as they saunter through a temporary "village" in the South Australian capital's Victoria Square. ​It's a cycling fan's delight. I've been watching these blokes on TV for years as they compete in races around the world – and now here they are, an arm's length away. Some stop for selfies with a small scattering of spectators before disappearing into a restricted-access marquee. Bocca Di Lupo restaurant in McLaren Vale opened last November. For one week every January, South Australia becomes the global centre of professional road cycling as the Tour Down Under kicks off the 37-event World Tour. The six-stage race traverses landscapes dotted with vineyards, providing an ideal opportunity to enjoy two of South Australia's most famous attractions simultaneously. The plan is to combine cellar doors and cycling - we'll visit establishments in the region of the day's stage, and catch some cycling action along the way. My coffee stop completed, I'm ready to roll. With the day's racing ending in the town of Uraidla, some 20km east of the CBD, it's an easy detour to Ashton Hills Vineyard, a winery specialising in pinot noir and cool-climate whites. Cellar door manager Jo Thompson takes us through a seven-item tasting menu, describing the Piccadilly Valley, Estate and Reserve pinots as her personal choices for "midweek, weekend and dinner party". We're travelling by car, but are soon joined by a two-wheeled Tour Down Under spectator who says he couldn't pass up a visit while in the area. I'm wondering if he'll be adding a wine bottle to his bicycle for later enjoyment – instead, he orders a delivery to his Melbourne address and hits the road again. We're also on the move – to Ambleside Distillers, near the German-influenced town of Hahndorf. Launched in 2016, the family-run establishment produces three gins, which you can savour neat, with tonic, or mixed into a variety of cocktails. A glass window on one end of the tasting bar allows you to eye the still – a copper contraption with multiple levels and portholes for adding ingredients – while a small menu features cheese and charcuterie. While we've been sipping, the racers have been duelling it out over 128 kilometres of the Adelaide Hills – it's time to head to the finish line. The stage finishes on the aptly named Greenhill Road that runs through the middle of Uraidla. We stroll to the finish line, where a massive TV screen with live commentary is keeping waiting spectators up to date. By now the temperature is heading into the high 30s, and with shade at a premium we nip into the ground floor of the Uraidla Hotel to share several platters from the extensive bar menu. The hotel is adjacent to the finish line, and crowds begin to form along the barricades lining the road edge as the cyclists approach the town. 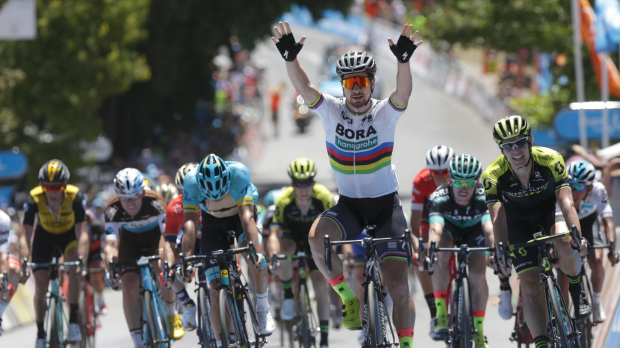 After much jousting in the final kilometres, the day finishes in a bunch sprint, with Sagan, resplendent in his rainbow-striped jersey, raising his arms forward like a cycling superman as he beats the rest to the line. One highlight of the TDU is that you can base yourself in Adelaide and still reach the racing every day, while Victoria Square's Tour Village has stalls, exhibitions, refreshments and movies projected onto a massive screen in the evening. When we return, my morning coffee spot is closed – just as well, as it'll be an early night, with another foray into the countryside on the morrow. Rising above a field of vines in the shape of an unsolved Rubik's cube, d'Arenberg's recent addition to the McLaren Vale landscape is a five-storey building that aims to stimulate all the senses. The first is sound: as one approaches, a curious music floats in the air – it's a DJ's track that is influenced and shaped by the daily weather conditions. Inside the Cube, the Alternate Realities Museum includes rooms with swirling artworks and videos projected onto the walls; a display of wall-mounted bike handlebars with rubber-bulb horns that puff out different aromas when squeezed; and a walk-through cluster of thousands of VHS videotapes hanging from the ceiling, a disorientating experience intended to conjure up the sensation of being inside a wine fermenter. Higher up the Cube, the windows of the calmer tasting room offer sweeping panoramas as we work through a nine-item list including shirazes called "Dead Arm" and "The Love Grass", while marvelling at the animated label on the $200 Athazagoraphobic Cat. Lastly, no visit is complete without a visit to the zany ablution facilities, where you'll find cartoon-character urinals and walls so blanketed with decorative foliage it's hard to locate the exit. After the spectacle of d'Arenberg, a visit to the nearby Hugh Hamilton Wines is like being enfolded in cool, calming greenery. 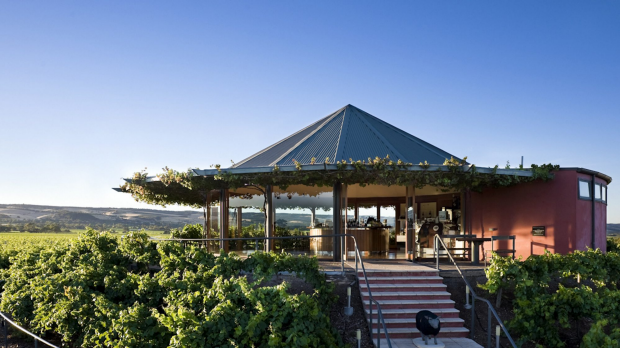 Raised on a plinth above the fields, the circular cellar door building has floor-to-ceiling windows topped with vine-laced awnings, so that the horizon is framed with foliage. A couple travelling by tandem bike are enjoying the ambience when we arrive to sample wines from a list with lively names: there's "The Ratbag" merlot, "The Mongrel" sangiovese blend and a "Scallywag" chardonnay. The cyclists are heading for Willunga Hill, some 12km further south, for the finish of the second-last stage. So are we, but we first nip a few hundred metres up the road for lunch at Mitolo's new restaurant, Bocca di Lupo, opened last November. The name means "mouth of the wolf", and is derived from a good luck salutation in Italian. The venue provides McLaren Vale with another visual feast – it's built from matte-black shipping containers linked with blond wood surfaces and floor-to-ceiling windows to create spaces both open and intimate. Green scene: Hugh Hamilton Wines in McLaren Vale. There are two degustation options, while the a la carte menu features lamb backstrap, barramundi and pumpkin ravioli; I plump for the pasta, preceded by baby beetroots with licorice sponge and walnut. Appetites satisfied, we go in search of cyclists. It's important to note that getting around during the TDU can be a tricky business – there are road closures, parking restrictions and masses of fellow spectators, while some areas are only accessible by bike or foot. We get a chance to cheer when our path intersects with the peloton as they loop through the vineyards, before a final vantage point on the hill itself. 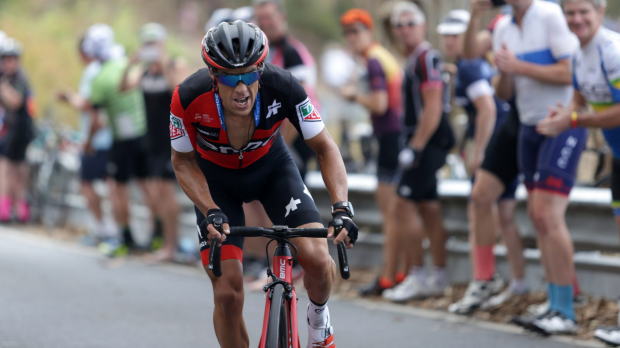 Richie Porte, a top international competitor and former TDU winner, has called the Willunga atmosphere "as good as any race in Europe" and it's no surprise he is a fan of this corner of South Australia; urged on by the crowd, the Tasmanian takes the lead with a kilometre to go, and storms home for his fifth consecutive win on Willunga Hill. But it's not enough for overall victory. South African Daryl Impey, riding for the Australian-based Mitchelton-Scott team, finishes eight seconds behind, but his overall time is identical to that of Porte. Through a countback system, Impey is awarded the leader's jersey going into the last day of competition. The final stage on the Sunday is a street circuit through the streets of Adelaide. It's a great opportunity for roadside spectators to watch a stage evolve from start to finish – but, as with the Tour de France finish on the Champs-Elysees, there is little chance the overall leadership might change. Breakaways are methodically hauled back in, and the final sprint is clinched by Greipel, while Impey retains his narrow advantage over Porte to claim the ochre jersey outright. So it's perhaps no surprise that the event is undergoing what race director Mike Turtur calls "the biggest change to the race since it became a World Tour event". Next year, the final stage will be held on the fabled Willunga Hill, with the contest for overall victory going down to the wire. Meanwhile, Uraidla will host another stage ending, but the riders will complete six laps of a 14km circuit before crossing the finish line. It will be the 21st edition of an event that has grown in stature over the years, with all the ingredients for a coming-of-age celebration in place. The choice of catering and spectacle locations is yours to make. The Santos Tour Down Under runs from January 10-20, 2019. The writer travelled to Adelaide as a guest of the South Australian Tourism Commission. INFORMATION: The Santos Tour Down Under website has information about stages, how to get to each event, parking and road closures. Visit tourdownunder.com.au. FLY: Qantas, Virgin, Jetstar and Tigerair all fly to Adelaide. TRAIN: The Overland runs between Melbourne and Adelaide on selected days. See greatsouthernrail.com.au.